Huge amount of fruits on a single truss. This season i have conducted a sort of expirement, i pruned one plant to a single stem, the second to two growing points and one plant i left wild no side shooting of any sort and i found that the one i left on a single stem gave very impressive huge trusses about 40 to 50 fruits on one truss and the two stem'd plant gave more amount of fruit than the single stem'd and huge trusses as well but the one i left wild gave smaller fruits and smaller trusses averaging 4-8 fruits per truss. 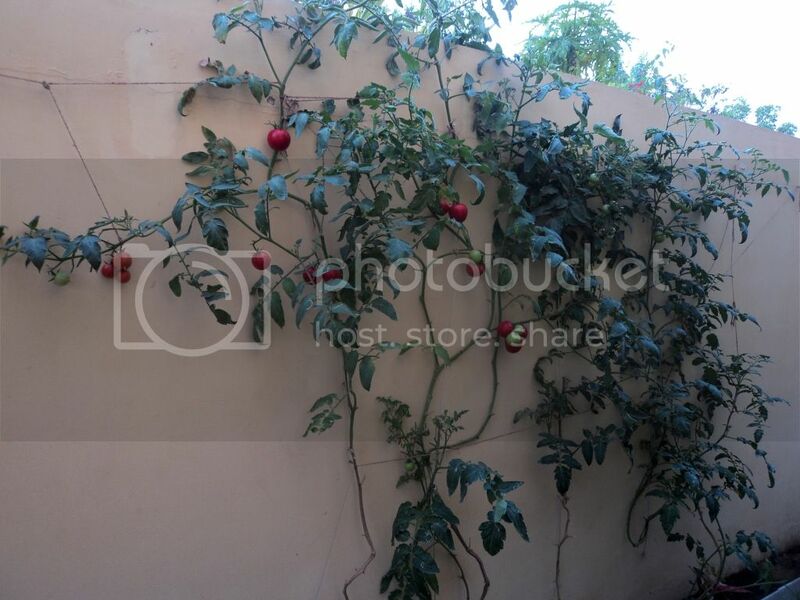 So to my conclusion it is better to prune the tomato to 1 or 2 growing points to get good quality and more fruits. Izhar bhai, the success in tomatoes comes from ample sunlight, the plants were getting more than 6 hours of sunlight and were regularly fed according to your recommendation and what i also did extra was give a shake 1-2 times to the plants so even if there were no pollinating insects around the fruit would set. Right now the plants have stopped growing and the top trusses have started to drop buds because of the cold weather... i will keep the plants as they are and see when tthey will start growing again and share the results. i also notice you havent pruned it to a single sturdy stem as this way bigger tomatoes are produced. We ate these this weekend, one of the sweetest tomatoes i have ever eaten..!! Izhar wrote: We ate these this weekend, one of the sweetest tomatoes i have ever eaten..! !